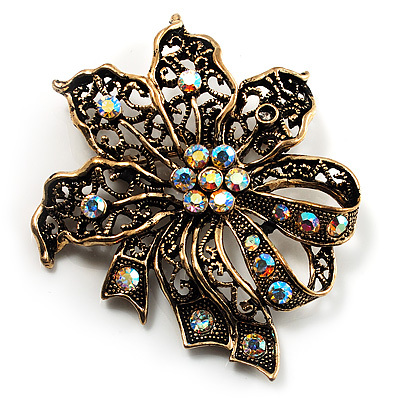 For a classic finishing touch to any outfit, look no further than this pretty Bronze-Tone Vintage Filigree Floral Brooch. Featuring a filigree floral design, crafted in bronze-tone finish and decorated with AB sparkling crystals for a fabulous look. The flower pin measures around 60mm x 53mm and secures with a flag and revolver fastener.